The beach is a way of life here and South Beach, or SoBe to its hip friends, is where it's at. Stretch out and show off your tan; indulge in some celeb-spotting; sip a cool margarita at an Ocean Drive bar; or dive into the Art Deco district to admire the architecture. Other beaches nearby are just as good though, and Central Beach and North Beach have the same silken sands and clear, warm ocean - but come with a more laid-back vibe. There are countless enclaves worth exploring away from the oceans' edge, and in Little Havana, you can still watch cigars being hand-rolled before tucking into trademark Cuban dishes like picadillo. Then there's the renowned Miami Design District, packed with galleries, exhibitions, street artists and avant-garde bars; and there's an impressive clutch of museums to discover too, including The Museum of Art and the Miami Children's Museum. If shopping is your guilty pleasure, then there's more temptation in Miami than your wallet can probably stand. There's upmarket Bal Harbour, with the city's most exclusive shops; there's Lincoln Road, 'the Fifth Avenue of the South'; there's Coco Walk, choc-a-bloc with boutiques and chains; and there's Dolphin Mall, where you can grab yourself a bargain. Just remember to leave yourself enough money to indulge in the city's delicious cuisine and to hit the night-spots. Because whatever time it is in Miami, the party has only just begun. The city's world-class zoo is huge and has over 700 animals roaming in a cageless environment for a fantastic safari experience. You can see creatures of all kinds, including white tigers, lions, bears, kangaroos and crocodiles. You can even go eye-to-eye with a giraffe from a raised feeding platform or take a ride on a camel. There are plenty of ways to enjoy the water. Key Biscayne and Hobie Beach are great for windsurfers, plus there's jet skiing, sailing and parasailing. The diving and snorkelling is top-notch too, with plenty of natural and man-made reefs to explore, plus numerous underwater wrecks. Small wonder Miami is known as the 'Wreckreational capital of the US'. From roof-top lounges to underground clubs, the Miami night scene is buzzing. You can salsa the night away in Little Havana, mingle with the beautiful people at the mega clubs along Ocean Drive, or check out the scene Downtown. And if none of that floats your boat, there's every type of restaurant, plus shows and cabarets galore. A trip out of the city to experience the lush tropical wetlands of the Everglades is a must. Skim across the water in an air boat watching alligators and manatees dash for cover, whilst spoonbills and ibises stalk among the sawgrass and mangrove swamps. It's the true beauty of nature like you've never seen it before. Miami likes to keep the party going, and that means festivals aplenty. There's the South Beach Wine & Food Festival and the Ocean Drive Winter Party Week in February; there's the Miami International Film Festival in March and the Latino Carnaval Miami; the massively popular Art Basel festival happens in December; and that's just for starters. Blurring the line between the glamour of the past, the luxury of the present and a new vision for tomorrow, this luxurious Miami resort is a relaxing oasis in the heart of hip Miami. Oceanfront on Miami Beach, Eden Roc's captivating vibe pulses with a dynamic convergence of modern and classic, delivering the unexpected with a sophisticated and memorable experience. Located on Collins Avenue, this 426 room hotel, featuring Miami's largest standard 650 sq. ft. sleeping rooms and 1,000 sq. ft. One Bedroom Suites, sits directly on 600 feet of pristine beachfront. In the heart of the historic Art Deco District, and just four blocks from the chic shops, restaurants and nightlife of Miami, this hotel puts couples and honeymooners in the heart of the action. The Gates Hotel South Beach caters to modern trendsetters looking for a different kind of travel experience. Our Miami Beach hotel is a sophisticated playground located on Lake Panacoast. Located on newly-fashionable West Avenue, Mondrian is a quiet enclave just minutes from the bustling centre of South Beach, offering spectacular views of Biscayne Bay and downtown Miami. Discover an oasis of service and style during stays at this splendid South Beach hotel. Designed by famed British architect David Chipperfield and surrounded by lush Matisse-inspired landscaping. Located in the heart of South Beach and directly on the ocean, Delano is the ultimate urban resort hotel. In an original manipulation of space that blurs all "normal" distinctions. Facing Ocean Drive and originally crafted as a simple yet sophisticated ocean front hotel, much of the historic soul and elegance of the Art Deco movement remains today. Fronting the Miami Beach Boardwalk, this classic oceanfront hotel appeals to families and active travellers alike with comfortable facilities in an appealing, tropical setting. Welcome to the tropically inspired Holiday Inn Miami Beach - Oceanfront, where the 1950's Miami Modern exterior blends seamlessly with vibrant contemporary South Beach style. Spend a few days moving to the Cuban rhythms of Miami, Florida before flying into the island paradise of the Dominican Republic on this sun-soaked twin centre holiday. First, head to Miami, an Art Deco, vibrant beach destination offering great year-round weather, top-ranked beaches and the sparkling waters of the Biscayne Bay. From here, fly down to the Caribbean island of Hispaniola and the tropical paradise of Punta Cana in the Dominican Republic. 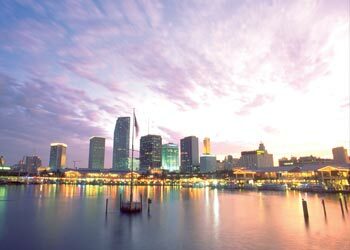 Begin your trip spending a few days in Tampa Bay, a town with many attractions to suit any budget and style. Following your stay in Tampa Bay, head to Fort Myers, known as Florida’s unspoiled island sanctuary, and spend your days pursuing one of the many watersports on offer. After your Fort Myers experience, spend the last part of your trip in the vibrant and exciting city of Miami, the USA’s premier playground, with its vibrant arts and cultural landscape, renowned nightlife scene and world-class dining and entertainment. Start your unforgettable twin centre holiday with a stay in Las Vegas, the 24 hour non-stop playground of fun and excitement. See a show or roll the roulette, the choice is yours! Plus you can't visit Las Vegas without visiting the awe-inspiring Grand Canyon! Next, head on to Miami, an Art Deco, vibrant beach destination offering great year-round weather, top-ranked beaches and the sparkling waters of the Biscayne Bay. Most commonly known for South Beach and the trendy nightlife it has to offer. You can do anything from people watching and shopping on Lincoln Road to partying the night away in famous nightclubs such as Nikki Beach Club. Stroll around the Art Deco and South Beach districts in Miami, sit on a terrace on Ocean Drive for people watching and get your shopping fix on Lincoln Road.